WASHINGTON — Thirteen Russians and three Russian companies were charged Friday with an elaborate plot to interfere in the 2016 U.S. presidential election through social media propaganda aimed at helping Republican Donald Trump and harming the prospects of his Democratic opponent, Hillary Clinton, prosecutors announced Friday. The indictment represents the most direct allegation to date of illegal Russian meddling during the election. The indictment arises from Mueller’s investigation into Russian interference in the election and whether there was improper coordination between the Trump campaign and the Kremlin. The charges are similar to the assessment of the U.S. intelligence community, which months after the election described a Russian government effort to meddle in the election on Trump’s behalf. The Russians’ “strategic goal” was to sow discord, the indictment says. By early-to-mid 2016, their efforts “included” supporting Trump’s campaign and disparaging Democrat Clinton. The charges say that Russians also communicated with “unwitting individuals” associated with the Trump campaign and other political activists to coordinate activities. 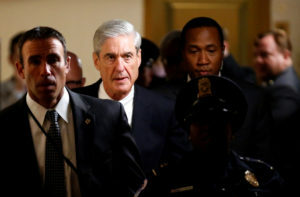 The charges are the latest allegations arising from Mueller’s probe and represent the first criminal case against Russians. Before Friday, four people, including Trump’s former national security adviser and former campaign chairman, had been charged. Deputy Attorney General Rod Rosenstein speaks about special counsel Robert Mueller’s indictment of 13 Russian nationals. According to the indictment, the Internet Research Agency, a Russian troll farm, started interfering as early as 2014 in U.S. politics, extending to the 2016 presidential election. The defendants, “posing as U.S. persons and creating false U.S. personas,” operated social media groups designed to attract U.S. audiences by stealing U.S. identities and falsely claiming to be U.S. activists. The indictment says the Internet Research Agency was funded by Yevgeny Prigozhin, a St. Petersburg businessman dubbed “Putin’s chef” because his restaurants and catering businesses once hosted the Kremlin leader’s dinners with foreign dignitaries. It was also funded by companies he controlled, according to the indictment.